Applied Works Upper clamp kit is computer designed, CNC machined on state of the art equipment, and then tested by professional riders to ensure quality, performance, and durability. 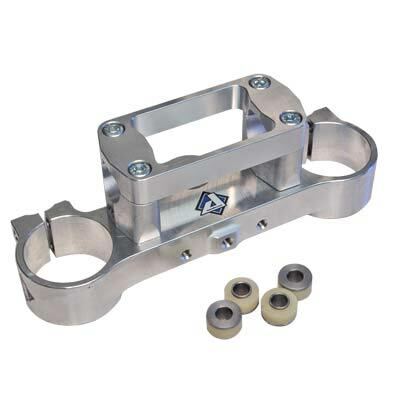 Machined using aircraft quality billet aluminum, Applied clamps are nearly twice the strength of stock triple clamps. Our innovative design provides greater fork rigidity and forward movement of the bars to provide better handling and better ergonomics. All upper clamp kits come complete with bar mounts, clamp, and all necessary hardware.